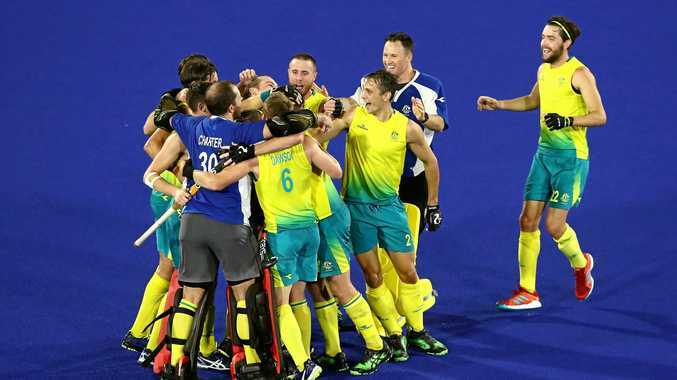 Retiring captain Mark Knowles has bowed out a winner after the Kookaburras defeated New Zealand 2-0 to claim the Commonwealth Games gold medal. Second-quarter goals from Aaron Kleinschmidt and Matthew Dawson gave Australia a commanding two-goal lead on Saturday before going on to win their sixth straight Games title. The 34-year-old Knowles had a chance to score a farewell goal in the final period but fired his penalty stroke high and wide. Australia set up the win with a dominant first half where they had six shots on target compared to one. After a tight first quarter, the Kookaburras upped the ante in the second and opened the scoring when Kleinschmidt's 21st-minute scoop went over New Zealand goalkeeper Richard Joyce. Dawson then doubled the advantage not long after with a trademark penalty corner flick, deflecting off a defender's stick into the back of the net. Not even the halftime break, nor an early green card to Lachlan Sharp, could turn momentum in New Zealand's favour, with only some desperate defending preventing Australia from extending their lead. The Kiwis pulled their keeper from the field in a bid for one final push, but simply had no answer for a Kookaburras defence that limited their opposition to just two looks at goal all night. Knowles retires after 318 matches, including an Olympic Games gold medal in Athens, two World Cup gold medals, and a 2014 player of the year award.